I am not a cabernet sauvignon fan. I find it hard to get into. One of the reasons I think is it never gets as ripe as it should or could here on the North Fork, unless Mother Nature is on your side. My palate enjoys a cabernet sauvignon in a blend much more than the varietal offering from most east end vineyards. Probably because the other varieties that are blended with it, like merlot or cabernet franc, do ripen. That being said, I will still taste and experiment with cabernet sauvignon. And that’s exactly what I did with Martha Clara Vineyards 2010 Cabernet Sauvignon ($29). 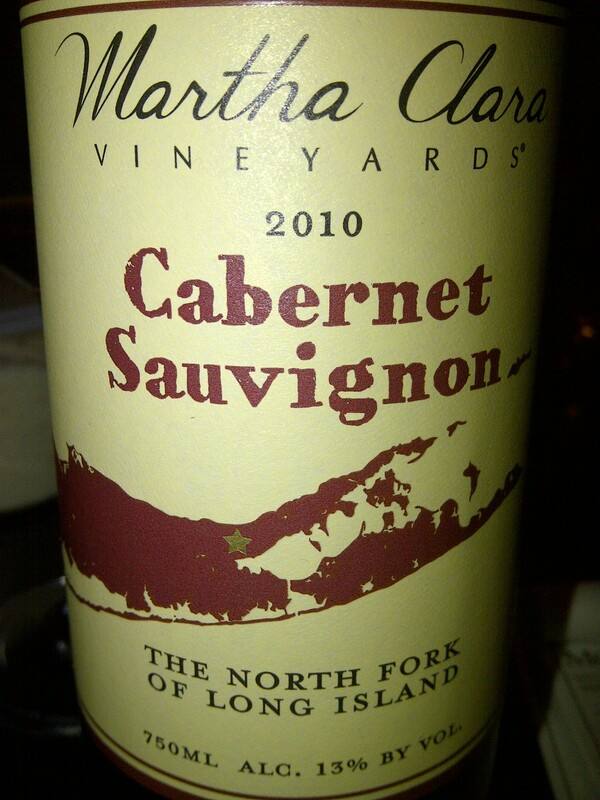 Martha Clara Vineyards does not produce a cabernet sauvignon in every vintage, in fact the last time they did was in 2007. More cassis or currant leads the way with blackberry, black cherry, vanilla tobacco, bay leaf and toasted spices. Chewy tannins and bright acidity round out the finish of cassis and chocolate. If you have not noticed, Martha Clara Vineyards changed their wine labels. I really like the new look. Classy and now you know what your drinking and where it’s from and who produces it. With the old labels, that was lost. This entry was posted in 2010, Cabernet Sauvigon, Long Island, Martha Clara and tagged Cabernet Sauvignon, Martha Clara, Martha Clara Vineyards, Wine, Wine tasting descriptors. Bookmark the permalink.